Peter Pan in the Kensington Gardens Т8 James Barrie was a Scottish novelist and playwright, best remembered today as the creator of Peter Pan, a free-spirited and mischievous young boy who can fly and never grows up. "Peter Pan in the Kensington Gardens" introduces Peter Pan, who discovered the magic of everyday existence amid the trees and flowers of Kensington Gardens. Before he flew away to Neverland, the little boy who wouldn't grow up dwelt in the heart of London, with birds and fairies. Аннотация к книге "Peter Pan in the Kensington Gardens"
James Barrie was a Scottish novelist and playwright, best remembered today as the creator of Peter Pan, a free-spirited and mischievous young boy who can fly and never grows up. "Peter Pan in the Kensington Gardens" introduces Peter Pan, who discovered the magic of everyday existence amid the trees and flowers of Kensington Gardens. Before he flew away to Neverland, the little boy who wouldn't grow up dwelt in the heart of London, with birds and fairies. –20 % Выгода 119 ₽ Питер Пэн и Венди 42 рец. –40 % Выгода 177 ₽ Любимые зарубежные сказки для самых маленьких 13 рец. –20 % Выгода 77 ₽ Питер Пэн 4 рец. 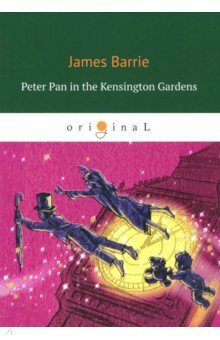 Если вы обнаружили ошибку в описании книги "Peter Pan in the Kensington Gardens" (автор Barrie James Matthew), пишите об этом в сообщении об ошибке. Спасибо!